Over 5 million strollers were sold last year, and according to our research nearly half of new parents wish they did more research before buying their current stroller. That's the type of statistic that motivates us to do our reviews and help you avoid buyer's remorse! This year we pulled together 13 top rated luxury strollers and had a group of 6 parents test and evaluate them. We then rated and ranked these fancy strollers based on their input and our own research in stores and online. After all our research, below are the best luxury strollers we could find! Here are the Best Luxury Strollers of 2019! 1. 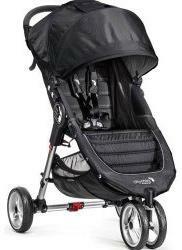 Britax B-Ready G3 Stroller. About $399. Here is an awesome, versatile, stylish luxury stroller with the capability to convert from a single stroller to inline double stroller. The "B-Ready" branding means you will be ready for another child if you ever need to wheel around two little ones. You can position the top seat forward or rear-facing, snap in a bassinet, or attach an infant car seat, without purchasing additional adapters. For this year, the G3 version has a new suspension system like on the BOB, and the tires are soft rubber so they nicely absorb a lot of smaller bumps. The seat has a great weight capacity of 55 pounds and features a large retractable canopy that gives great shade coverage. We liked that it reclined to 4 positions and had an adjustable leg rest to accommodate a growing child. It is also one of the most versatile luxury strollers on the market, with 12 different configurations: you can use it as-is, but you can also reconfigure to attach any Britax infant car seat with the Click-and-Go system. You can do the primary seat plus an infant car seat attached at the same time, you can do two infant car seats attached at the same time, and you can also configure it to add the beautiful Britax bassinet (pram style). So if you have a toddler and a newborn, this stroller is a great option for you! The reviewers loved the soft cloth and padding, adjustable handle for shorter or taller parents, and a really large zip-up storage basket. We loved that you can swap the seat backwards so that your baby will be facing you - nice touch! It can accommodate the Britax and B-Safe 35 Infant Car Seats, and also supports the Britax stroller board for older kids to stand on. Negatives? Well, this stroller is a bit of a beast which can make it heavy to push up hills and lift into the back of a car. Also, for this year they dropped the parent cup holder, which was unfortunate. The Britax B-Ready is overall an excellent high-end stroller, and comes in several different stylish colors to meet your trend-setting needs. Interested? 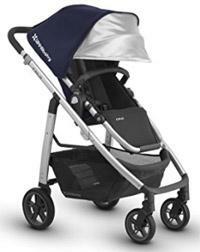 You can check out the Britax B-Ready G3 Stroller here. 2. Quinny Buzz Xtra 2.0 Stroller. About $400-500. This is a unique-looking, and great performing luxury stroller brought to you by Quinn, who make several varieties of higher end strollers (see them here). This particular one is stylish and capable. Using a three-wheel design with good-sized wheels up front, and quite large wheels in the back, this stroller is highly maneuverable, glides smoothly over even bumpy terrain, and looks great doing so. Those tires are actually puncture resistant as well. The seat can be positioned as front or rear facing, and the recline is really fantastic, allowing you to go as far back as you'd like. Supports kids up to 50 pounds, though that's going to be a tight fit for a child that size. The materials feel quite nice, including the seat itself, the 5-point harness, and the good-sized canopy. In our testing, we found folding to be rather easy and nearly capable of being done single-handedly. Unfolding was even easier, being assisted by a small hydraulic system that helps pop the stroller open. Nice touch! There is a good-size basket on the bottom, that is a bit awkward to access given the frame bar over the top. The handlebar is adjustable, but pretty limited in its range of adjustment, though it was suitable for taller moms over 5'9". There is a great brake that is activated by a foot pedal. The stroller includes a car seat adapter, which is compatible with the Maxi-Cosi Mico series (original Mico, Mico NXT, Mico AP, and Mico Max 30), the Prezi, and the Quinny Dreami bassinet and Tukk carrier. Overall, an excellent option! Interested? You can check out the Quinny Buzz here! 3. Bumbleride Indie Baby Stroller. Another sleek, contemporary looking three-wheel luxury stroller that will get heads turning with its soft lines, mixed aluminum materials, and high quality fabrics. 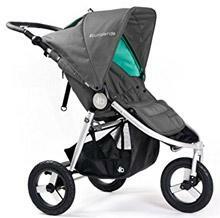 The Bumbleride series is a very high quality, reliable, and durable stroller with excellent features and craftsmanship. In our testing, we thought this was one of the smoothest strollers on the market: turns and curb-hops were like butter, and the lightweight (only 22 pounds) frame makes it easy to negotiate the urban jungle! The fabric is super soft and high quality, and uses eco-friendly recycled materials. The recline is very deep, which is awesome, and the canopy comes out really far over your baby's head, torso, and upper legs. We tested it out on babies from 3 months (about 15 pounds) and up to the weight limit of about 55 pounds (!). Was definitely too small for our 55-pound 10 year old, but outside of that it worked excellently up to about 35-40 pounds. For infants, you can recline the seat way back and adjust the footrest up to basically turn the seat into a bassinet, which is a unique and adorable feature. Combine that with the canopy, and you can really have a nicely supported infant that's protected from the elements. For infants, the seat goes *nearly* flat, and for toddlers it goes *nearly* upright. So while you can connect some infant car seats (with the adapter), like the Maxi Cosi or Cybex Aton, you might not need that as much as you'd think. We also liked the adjustable handlebar height, the lock-out front wheel for jogging (they also have a specific indie version for jogging, with larger rear wheels), the jogging wrist strap, and the decently compact folding size (32" x 24.5" x 11.5"). The storage basket was also reasonably sized and easy to access from the rear (but not from the sides), folding was super easy and intuitive, and we were impressed by the 3 year warranty. 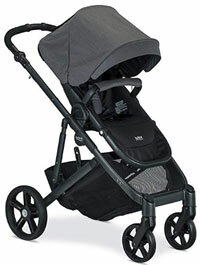 Overall, this is an excellent luxury stroller for year-round use with both infants and big kids. Cons? Well, the seat is deep and canopy so large that makes it difficult to pull your baby out, even when the canopy is retracted it sort of blocks access. You need to pull the baby straight out from the front, not upwards and out, and this gets really tricky as your baby gets taller. And no cupholders for baby or parents, but that seems par for the course with these sleek strollers. Overall, an excellent option! Interested? You can check out the Bumbleride Indie here. 4. BOB Revolution Flex 3.0 Single Stroller. This is an awesome, great looking, and innovative luxury stroller with all the right features. Whether in the urban jungle, at the zoo, or at the beach, you will find that the large wheels and great swiveling front wheel will help you through the toughest of terrain. Thinking about jogging? 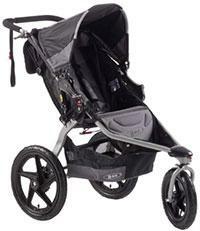 This stroller is sporty too, with great posture and handles for a nice long run with your baby. We found the frame super sturdy and durable, the folding mechanism very straight forward, and suspension ready to give your baby a nice smooth ride. Want to pop in your baby's car seat on some days? There are available car seat adapters for Britax, BOB, Chicco, and Peg Perego seats. The strollers is good for 8+ weeks of age and up to 70 pounds. That means you'll basically go from birth (for walking, not jogging!) all the way up until about 7 years old. By then your kid will probably not want to be seen in a stroller anyway! In our review, we thought the fabric was soft and high quality, the folding mechanism was easy to use, and the storage underneath was ample and easy to access. The only downfalls were that the bottom seat padding could be a bit plusher, and there is no cup holder. 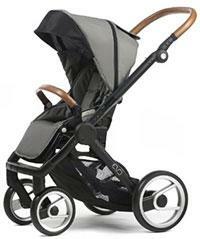 Overall this is our favorite jogging-style luxury stroller, highly recommended! This great stroller is also available in a duallie two-seat version for about $550. Interested? You can check out the BOB Revolution Flex here. 5. City Mini Baby Jogger GT Single Stroller. The City Mini (and also the City Select) is a popular high-end stroller option that you will likely see other moms pushing around town. This stroller is an excellent option for discerning parents. It is soft and comforable for your baby, folds with the pull of a single strap, has an adjustable handlebar, and a hand-operated parking brake. Our reviewers loved the fully adjustable handle bar, which they thought was awesome for short moms and tall dads. The large 8" front wheels have suspension, and all wheels have traction to handle tough terrain. It supports up to a 50 pound baby, and the canopy has UB 50+ protection from the sun. It is smaller and lighter than the BOB or Britax, but it's still quite large. For 2018-2019, this stroller has improved in terms of its agility, making it easier to manage one-handed, and the wheels aren't as wobbly as they used to be. Negatives? There is also no cup holder, and the bottom storage area wasn't up to par with the BOB or Britax. Also, any convenient accessories are additional cost, like a cup holder, infant car seat adapter, etc. That can add up when you consider what the Britax offers out of the box. This is a great stroller overall, but we think you're better off with options 1 or 2. Interested? You can check out the City Mini Baby Jogger Stroller here. 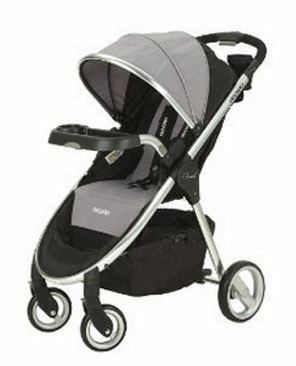 This is another great option for the best high-end strollers. Limited availability right now. UppaBaby calls this stroller "compact without compromise" and we think they're on to something with this product. It's expensive, but it's also lightweight and full of great features. What features? Well, it has a flexible reclining seat with multiple positions, an adjustable handle bar, adjustable canopy, soft wheels for absorbing small bumps, reversible toddler position (ride forward or rear-facing), drop-down sunshade that extends the canopy on bright days, and a large storage bin. Our reviewers loved this stroller and found it nicely maneuverable, versatile, and full-featured while also being very simplistic looking in a sleek trendy design. Speaking of design, this UppaBaby stroller is available in multiple colors and patterns to fit your fancy. Cons? Well, given how sleek the design is, the reviewers expected it to be lighter weight but found it rather heavy. They also noted that there were no cup holders, no suspension on the wheels, and rather small wheels that don't allow anything other than urban strolling on smooth pavement. Finally, they thought the folding mechanism was cumbersome and typically required 2 hands to operate. So while there are a lot of excellent features, and it has a stylish simple frame design, there are some smaller drawbacks that might not justify the $500+ price tag. Interested? 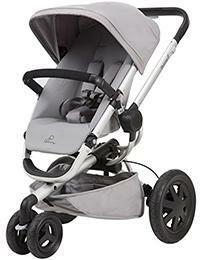 You can check out the UppaBaby Cruz Stroller here. 7. RECARO Performance Denali Stroller. This is a relatively simple option, and comes in as the cheapest on the list. It is a great stroller with great features. We loved that this price point could give you full 4-wheel suspension for smooth rides, a large adjustable canopy, truly one-handed quick folding, a cup holder and mesh pocket, a storage basket, soft durable fabrics, multi-position seat recline, and a great weight range of 5 to 50 pounds. Our reviewers loved a lot of things about this stroller. They loved that it included a removable child's tray and infant seat adapter without having to buy extra accessories. They also thought the lower storage basket was one of the largest and best-accessible in the bunch, and they liked the look of the shiny chrome frame and the 7 available colors and patterns. One of our reviewers thought they found some clues that it is actually built by Britax, but we can't be so certain. So what are the negatives? Well, it's not quite as high of build quality as the other options. Our reviewers found the frame a bit too flexible especially with heavier kids, and reviewers thought that some parts felt a bit flimsy and possibly would break easily. Relative to the other options on this list, this stroller has great features but the overall build quality isn't quite on par. We suggest splurging a bit for the other options. features, and could conquer all that rough and tumble urban terrain. It was the Mutsy Evo Urban Nomad, which is one of our all-time favorite luxury strollers that uses a pram-style bassinet and a traditional seat, but it's a bit hard to find and outrageously expensive. It's pictured to the right. Sells for around $500 and that doesn't even include the bassinet attachment, nevermind the Maxi Cosi carseat that fits it (or the special adapter you need to make it work). But was it worth the cost? If you're willing to spend about $300-500 on a stroller then we say yes! why not splurge a bit to make yourself look good after cleaning spit-up off your shirt and figuring out how to change a diaper in that ill-equipped Starbucks bathroom. Especially when you're feeling a little down in the dumps, you need some nice things to make life a little better! Not only are these strollers a bit pricier than the ones on our list of best strollers or best lightweight strollers, but they are: more comfortable, more stylish, more versatile, have a smoother ride, and tend to have a sturdier build quality and pack more comfort features. These are what make the best luxury strollers more expensive than the others: better features, styling, and reliability. Also check out our stroller buying guide for information about how to choose a stroller.